For the complete ranking of countries, see List of countries by Human Development Index. The 2010 Human Development Report introduced an Inequality-adjusted Human Development Index (IHDI). While the simple HDI remains useful, it stated that "the IHDI is the actual level of human development (accounting for inequality)", and "the HDI can be viewed as an index of 'potential' human development (or the maximum IHDI that could be achieved if there were no inequality)". The index does not take into account several factors, such as the net wealth per capita or the relative quality of goods in a country. This situation tends to lower the ranking for some of the most advanced countries, such as the G7 members and others. The index is based on the human development approach, developed by ul Haq, often framed in terms of whether people are able to "be" and "do" desirable things in life. Examples include—Being: well fed, sheltered, healthy; Doings: work, education, voting, participating in community life. The freedom of choice is central—someone choosing to be hungry (as during a religious fast) is quite different from someone who is hungry because they cannot afford to buy food, or because the country is in a famine. The origins of the HDI are found in the annual Human Development Reports produced by the Human Development Report Office of the United Nations Development Programme (UNDP). These were devised and launched by Pakistani economist Mahbub ul Haq in 1990, and had the explicit purpose "to shift the focus of development economics from national income accounting to people-centered policies". To produce the Human Development Reports, Mahbub ul Haq formed a group of development economists including Paul Streeten, Frances Stewart, Gustav Ranis, Keith Griffin, Sudhir Anand, and Meghnad Desai. Nobel laureate Amartya Sen utilized Haq's work in his own work on human capabilities. Haq believed that a simple composite measure of human development was needed to convince the public, academics, and politicians that they can and should evaluate development not only by economic advances but also improvements in human well-being. The underlying principle behind the Human Development Index. The Inequality-adjusted Human Development Index (IHDI) is a "measure of the average level of human development of people in a society once inequality is taken into account". The rankings are not relative to the HDI list above due to the exclusion of countries which are missing IHDI data (p. 30). Countries in the top quartile of HDI ("very high human development" group) with a missing IHDI: Taiwan, Liechtenstein, Saudi Arabia, United Arab Emirates, Andorra, Qatar, Brunei, Bahrain, Oman, Bahamas, Kuwait and Malaysia. The rankings are not relative to the HDI list above due to the exclusion of countries which are missing IHDI data (p. 206). Countries in the top quartile of HDI ("very high human development" group) with a missing IHDI: Taiwan, New Zealand, Singapore, Hong Kong, Liechtenstein, Brunei, Qatar, Saudi Arabia, Andorra, United Arab Emirates, Bahrain, and Kuwait.
) represent changes in rank. The rankings are not relative to the HDI list above due to the exclusion of countries which are missing IHDI data (p. 216). Countries in the top quartile of HDI ("very high human development" group) with a missing IHDI: Taiwan, New Zealand, Singapore, Hong Kong, Liechtenstein, Brunei, Qatar, Saudi Arabia, Andorra, United Arab Emirates, Bahrain, Cuba, and Kuwait. Some countries were not included for various reasons, primarily due to the lack of necessary data. The following United Nations Member States were not included in the 2014 report: North Korea, Marshall Islands, Monaco, Nauru, San Marino, Somalia, South Sudan, Sudan, and Tuvalu.
) represent changes in rank. The rankings are not relative to the HDI list above due to the exclusion of countries which are missing IHDI data (p. 168). The list below displays the top-ranked country from each year of the Human Development Index. Norway has been ranked the highest fourteen times, Canada eight times, and Japan three times. Iceland has been ranked highest twice. The Human Development Index has been criticized on a number of grounds, including alleged lack of consideration of technological development or contributions to the human civilization, focusing exclusively on national performance and ranking, lack of attention to development from a global perspective, measurement error of the underlying statistics, and on the UNDP's changes in formula which can lead to severe misclassification in the categorisation of 'low', 'medium', 'high' or 'very high' human development countries. Economists Hendrik Wolff, Howard Chong and Maximilian Auffhammer discuss the HDI from the perspective of data error in the underlying health, education and income statistics used to construct the HDI. They identified three sources of data error which are due to (i) data updating, (ii) formula revisions and (iii) thresholds to classify a country's development status and conclude that 11%, 21% and 34% of all countries can be interpreted as currently misclassified in the development bins due to the three sources of data error, respectively. The authors suggest that the United Nations should discontinue the practice of classifying countries into development bins because: the cut-off values seem arbitrary, can provide incentives for strategic behavior in reporting official statistics, and have the potential to misguide politicians, investors, charity donors and the public who use the HDI at large. In 2010, the UNDP reacted to the criticism and updated the thresholds to classify nations as low, medium, and high human development countries. In a comment to The Economist in early January 2011, the Human Development Report Office responded to a 6 January 2011 article in the magazine which discusses the Wolff et al. paper. The Human Development Report Office states that they undertook a systematic revision of the methods used for the calculation of the HDI, and that the new methodology directly addresses the critique by Wolff et al. in that it generates a system for continuously updating the human-development categories whenever formula or data revisions take place. In 2013, Salvatore Monni and Alessandro Spaventa emphasized that in the debate of GDP versus HDI, it is often forgotten that these are both external indicators that prioritize different benchmarks upon which the quantification of societal welfare can be predicated. The larger question is whether it is possible to shift the focus of policy from a battle between competing paradigms to a mechanism for eliciting information on well-being directly from the population. ^ A. Stanton, Elizabeth (February 2007). "The Human Development Index: A History". PERI Working Papers: 14–15. Archived from the original on 28 February 2019. Retrieved 28 February 2019. ^ "Human Development Index". Economic Times. Archived from the original on 1 December 2017. Retrieved 29 November 2017. ^ a b "The Human Development concept". UNDP. 2010. Archived from the original on 15 April 2012. Retrieved 29 July 2011. ^ a b "What is Human Development". UNDP. 2017. Archived from the original on 27 October 2017. Retrieved 27 October 2017. ^ a b c d e f g h i "Table 2. 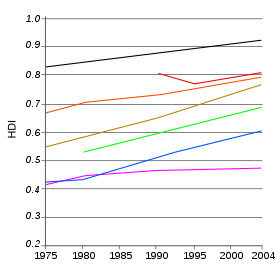 Human Development Index Trends, 1990-2017". HDRO (Human Development Report Office) United Nations Development Programme. Archived (PDF) from the original on 22 March 2017. Retrieved 14 September 2018. ^ "Human Development Report 2010". UNDP. 4 November 2010. Archived from the original on 22 December 2015. Retrieved 15 December 2015. ^ "Technical notes" (PDF). UNDP. 2013. Archived (PDF) from the original on 16 June 2015. Retrieved 15 December 2015. ^ "New method of calculation of Human Development Index (HDI)". India Study Channel. 1 June 2011. Archived from the original on 10 November 2017. Retrieved 19 November 2017. ^ Mean years of schooling (of adults) (years) is a calculation of the average number of years of education received by people ages 25 and older in their lifetime based on education attainment levels of the population converted into years of schooling based on theoretical duration of each level of education attended. Source: Barro, R. J.; Lee, J.-W. (2010). "A New Data Set of Educational Attainment in the World, 1950–2010". NBER Working Paper No. 15902. doi:10.3386/w15902. Archived from the original on 7 August 2011. Retrieved 29 July 2011. ^ a b "Human Development Indices and Indicators – 2018 Statistical Update" (PDF). HDRO (Human Development Report Office) United Nations Development Programme. pp. 22–25. Archived (PDF) from the original on 22 March 2017. Retrieved 14 September 2018. ^ "Human Development Report 2018 – "Human Development Indices and Indicators"" (PDF). HDRO (Human Development Report Office) United Nations Development Programme. pp. 30–33. Archived (PDF) from the original on 22 March 2017. Retrieved 14 September 2018. ^ "Human Development Report 2016" (PDF). United Nations Development Programme. Archived (PDF) from the original on 27 March 2017. Retrieved 12 July 2017. ^ a b c d "Human Development Report 2016—'Human Development for everyone'" (PDF). HDRO (Human Development Report Office) United Nations Development Programme. Archived (PDF) from the original on 27 March 2017. Retrieved 21 March 2017. ^ "Report" (PDF). hdr.undp.org. 2016. Archived (PDF) from the original on 27 March 2017. Retrieved 22 March 2017. ^ a b "Statistics" (PDF). hdr.undp.org. 2015. Archived (PDF) from the original on 19 March 2016. Retrieved 20 December 2015. ^ a b Taiwan's government calculated its HDI to be 0.882, based on 2010 new methodology of UNDP. "2011中華民國人類發展指數 (HDI)" (PDF) (in Chinese). Directorate General of Budget, Accounting and Statistics, Executive Yuan, R.O.C. 2011. Archived (PDF) from the original on 20 October 2014. Retrieved 21 November 2011. ^ a b c d "Human Development Report 2015—'Sustaining Human Progress: Reducing Vulnerabilities and Building Resilience'" (PDF). HDRO (Human Development Report Office) United Nations Development Programme. Archived (PDF) from the original on 19 March 2016. Retrieved 14 December 2015. ^ a b The UN does not recognize the Republic of China (Taiwan) as a sovereign state. The HDI report does not include Taiwan as part of the People's Republic of China when calculating China's figures. Taiwan's government calculated its HDI to be 0.882, based on 2010 new methodology of UNDP. "2011中華民國人類發展指數 (HDI)" (PDF) (in Chinese). Directorate General of Budget, Accounting and Statistics, Executive Yuan, R.O.C. 2011. Archived (PDF) from the original on 20 October 2014. Retrieved 21 November 2011. ^ a b c "Data" (PDF). hdr.undp.org. 2014. Archived (PDF) from the original on 18 October 2015. Retrieved 25 July 2014. ^ a b c d "Human Development Report 2014—'Sustaining Human Progress: Reducing Vulnerabilities and Building Resilience'". HDRO (Human Development Report Office) United Nations Development Programme. Archived from the original on 27 July 2014. Retrieved 25 July 2014. ^ Hastings, David A. (2009). "Filling Gaps in the Human Development Index". United Nations Economic and Social Commission for Asia and the Pacific, Working Paper WP/09/02. Archived from the original on 30 April 2011. Retrieved 1 December 2009. ^ "UNDP Human Development Report Office's comments". The Economist. January 2011. Archived from the original on 11 February 2011. Retrieved 12 January 2011. ^ "The Economist (pages 60–61 in the issue of Jan 8, 2011)". 6 January 2011. Archived from the original on 13 January 2011. Retrieved 12 January 2011. An independent HDI covering 232 countries, formulated along the lines of the traditional (pre-2010) approach.